ROMANIA’S LEGENDARY GYPSY BRASS BAND FANFARE CIOČARLIA @ PACE UNIVERSITY | STREETS OF NEW YORK 411 INC.
Romania’s Legendary Gypsy Brass Band Fanfare Ciočarlia is confirmed to perform at Pace University. 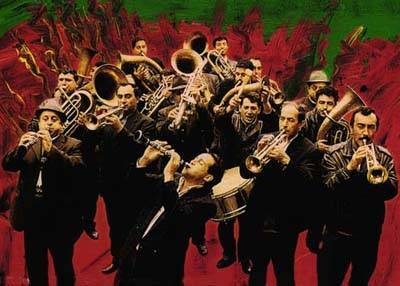 The thrilling 12-piece brass orchestra and one of the world’s most cherished Gypsy bands returns to NYC after ten years! Fanfare’s breakneck speed, technical chops, ripping rhythms and sweet’ n sour horns have been sampled and covered, championed and emulated by countless DJs, bands and Gypsy orchestras. Their wild interpretations of popular Western standards like the “James Bond Theme” and Duke Ellington’s “Caravan” show how this Romanian orchestra can effortlessly put a Gypsy spin on any music they get their horns on.